Responsible, practical Miss Hermione Rogers, has been crafting stories as the notorious Mr. Michael Michaelmas and selling them for a meager wage to support her siblings. The only real way to ensure her family’s ruinous debts are paid, however, is to marry. Tall, thin, and plain, she has no expectation of success. In London for her first Season she seizes the chance to write the tale of a brooding duke. In her research, she finds Sebastian Fitzhugh, the 5th Duke of Mallen, who unfortunately is perfectly affable, charming, and so nicely… configured… he takes her breath away. He lacks all the character traits she needs for her story, but alas, any duke will have to do. Sebastian Fitzhugh, the 5th Duke of Mallen has been deceived so many times during the high-stakes game of courtship, he’s lost faith in society women. Yet, after a chance encounter with Hermione, he finds himself intrigued. Not a woman he’d normally consider beautiful, the young lady’s practical bent, her forthright nature and her tendency to turn up in the oddest places has his interests… roused. He’d like to trust her, he’d like to do a whole lot more with her too, but should he? 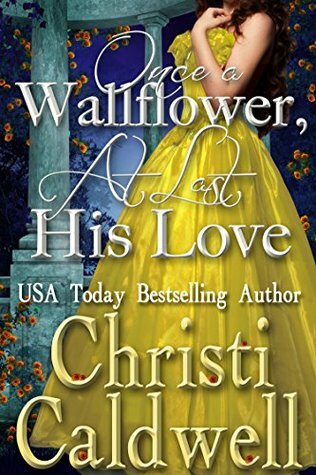 ONCE A WALLFLOWER, AT LAST HIS LOVE by Christi Caldwell is a wonderful Regency Historical Romance set in 1808 England. #6 in the ” Scandalous Seasons”, but can be read as a stand alone. Although, I would suggest reading the others in this amazing series. Meet, Miss Hermione Rogers, aka, Mr. Michael Michaelmas and Sebastian Fitzhugh, the 5th Duke of Mallen. While, Hermione, is a notorious storyteller, she is also a wallflower, feisty, strong-willed and determined to protect and support her siblings, in the only way she know how other than marriage, by writing her stories. You, see, no marriage minded gentleman even looks at her, she is too opinionated, that is until Sebastian Fitzhugh enters her life. Sebastian, is serious, and know his responsibilities and holds them dear. An enjoyable read with likeable characters and an interesting storyline. Ms. Caldwell has once again written a story that grips the reader, with her comfortable, passionate story, her engaging, and likeable characters. While, this story, is filled with emotions, it also, has it humorous moments, when her younger brother and sister, first meet Sebastian, for instance. Ms. Caldwell, addresses the issues of having a mental handicapped sibling, Hermoine’s elder sister, Elizabeth, due to a fever years prior and what happens to her, that may cause a scandal, with honesty, consistency and seriousness. The secondary characters help to carry the story. An enjoyable read! Well written with emotion, drama, and love. Romance blended with family tragedy and love. Well done! *The sensual content was confined within the marriage bed*. I enjoyed that as well. Thank you so, so much for taking the time to read and review “Once a Wallflower, At Last His Love”! And thank you for such a beautiful review!